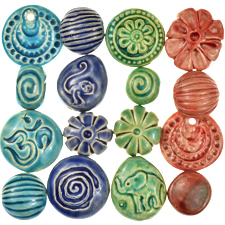 We are very excited to introduce our latest ethically sourced Artisan product, Claycult Cambodia Ceramic Beads, that supports our Women Helping Women Mission. Claycult's primary objective is to provide sustainable, long term employment in a safe work environment and offer education and training to the staff and their families. 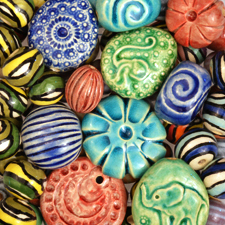 They teach them the skills to make beautiful artisan beads and nurture and encourage the talents they show. They provide training in all aspects of the business from the making of the clay and beads, to the techniques of painting and glazing, to color and design. Click here to see our Claycult Design Ideas. They employ mostly women and adapt the work place to their lives as much as possible, outsourcing to those who are unable to come to the workshop because of family commitments or flexible hours to accommodate those caring for families. They encourage education, sending those who have a desire to school. The staff is paid a fair wage, many of them being the sole supporter of an extended family, a fresh home cooked lunch is also provided. 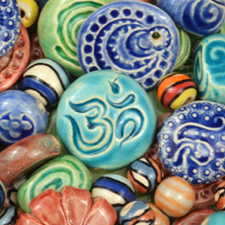 All of their items are handcrafted; from the digging and production of the clay, to the rolling, shaping and painting of the beads. The artists includes some very creative young people who gain inspiration from their history, including the great temples of Angkor and thus find a way to connect with their lost past. The owners of Claycult say of their staff: "It is an everyday wonder to watch the staff who, not long ago, knew nothing of clay, beads, design, the firing of clay, sales and so forth, step forward with ideas and designs of their own which we encourage and then encourage some more. Inspired by the world around them, they bring the culture of the Khmer people and the colors of this land into their designs."